Allison Janney poses in the press room with the award for best performance by an actress in a supporting role in any motion picture for "I, Tonya" at the 75th annual Golden Globe Awards Sunday, Jan. 7, 2018, in Beverly Hills. Angelina Jolie arrives at the 75th annual Golden Globe Awards at the Beverly Hilton Hotel on Sunday, Jan. 7, 2018, in Beverly Hills, California. One of the most glaring snubs in this year's movie nominations came in the best director category, where Greta Gerwig was passed over for her much-loved "Lady Bird.'' Natalie Portman, presenting the director prize, was not about to let that go unnoticed. "And here are the all MALE nominees,'' she quipped, to knowing laughter. (Guillermo del Toro won for "The Shape of Water.'') Barbra Streisand also took a jab at the Globes, noting that she'd been the only woman to have won best director - in 1984. "That was 34 years ago, folks. Time's up!'' she said. 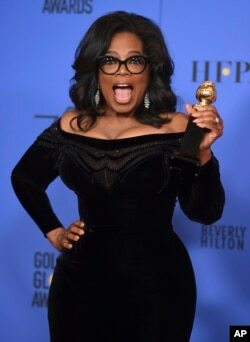 Oprah Winfrey poses in the press room with the Cecil B. DeMille Award at the 75th annual Golden Globe Awards at the Beverly Hilton Hotel on Sunday, Jan. 7, 2018, in Beverly Hills, Calif. There's been much talk about equal pay lately, but Debra Messing and Eva Longoria got very specific, calling out E! Entertainment Television on the issue while doing interviews with them on the red carpet. Messing referenced the recent departure from E! of host Catt Sadler, who has said she was making about half the pay of her male counterpart, Jason Kennedy. Kerry Washington, from left, Debra Messing, and Eva Longoria arrive at the InStyle and Warner Bros. Golden Globes afterparty at the Beverly Hilton Hotel on Sunday, Jan. 7, 2018, in Beverly Hills, Calif.
Longoria also made the point, to Ryan Seacrest. "We support gender equity and equal pay and we hope that E! follows that lead with Catt as well,'' she said. She was joking there, too.